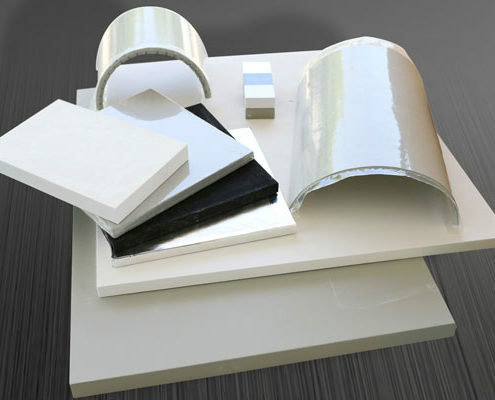 Microporous insulation panels are the first choice for high temperature insulation applications. When using this product a high thermal insulation performance will be achieved, along with simultaneously low insulation thickness. In this way this synthesis guarantees a technologically sophisticated insulation and a high economic efficiency. The panels for high temperature application are non-flammable and conform to the requirements of fire resistance ‘Grade A’. 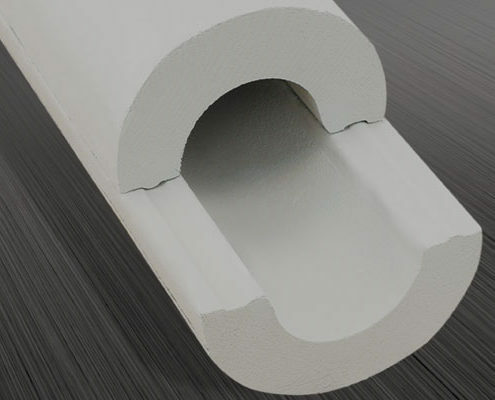 The outstanding insulation effect and the low space requirement of the insulation are due to the extremely low thermal conductivity of the microporous material. Owing to their microporous structure and the existence of opacifiers, all three components of heat transmission – conduction, convection and radiation – are optimized to the physical limit under atmospheric pressure. The low material conduction arises from the very small silica particle agglomerates of approximately 10 nm which only have a single point to touch each other. The pores in which the gas molecules could transfer their energyto the next molecule are smaller than the necessary free path length of the gas. As an effect the convection is limited to a minimum. The specified minerals cause the infrared radiation to be limited. The product can be processed by using standard woodworking tools and machines. It can be cut, sawed or even milled. An additional feature of the material is a high flexural strength. As a result the insulation panels are quick and easy to handle even in demanding installation contexts. Microporous insulation panels are characterized by a high temperature resistance of up to 1050 °C (1922 °F). In particular at high temperatures the products far exceed the insulating effect of alternative insulation materials. The low rising of the thermal conductivity with temperature increase and the minimal shrinkage at maximum temperature is also advantageous. The microporous material is thermal shock resistant. It tolerates fast heating and cooling cycles for a long duration of time. The following advantages arise from the use of microporous insulating products in comparison to conventional materials. 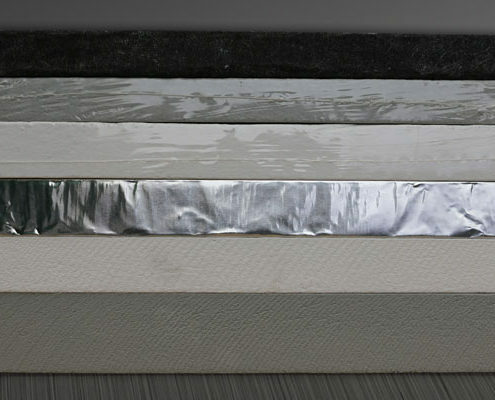 The Unicorn insulating panels are provided in a wide variety of dimensions. The required length and width of the panel can be chosen more or less without restriction. 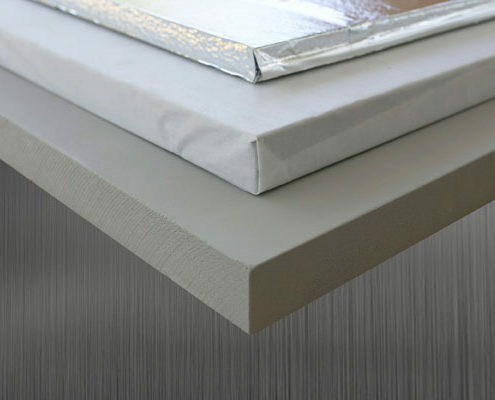 Thicknesses of insulation panels from 4 mm up to 50 mm and various formats (standard: 1020 mm x 615 mm) are available. Slatted and flexible panels are also provided. These panels can be bent in order to insulate curved shapes. Customized pressing molds deliver exactly the required dimensions in an application and reduce the cutting waste to a minimum. Using a customized press mold amounts in a considerable economical advantage for large order volumes. The Unicorn shell technology allows maximum flexibility and economic efficiency for pipe insulations. One of the biggest challenges for the user when insulating is the very large number of different pipe diameters. Unicorn shell technology masters this challenge easily and quickly. 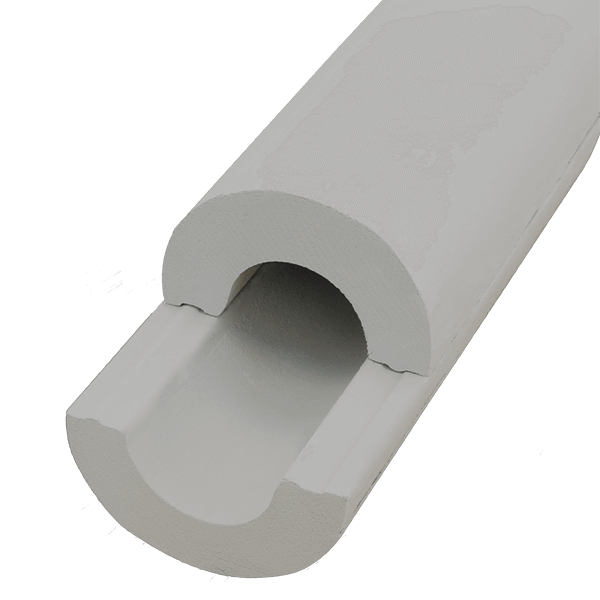 The sections are available in widely variable thicknesses of pipe insulations and internal diameters with a length of up to 1000 mm. Since Unicorn shell technology provides compressed sections, the user benefits from an excellent cost- performance ratio. In using Unicorn core material, the Vacuum Insulation Panel manufacturer benefits from a list of important features typical of the microporous insulation material. Being the longest lasting among the core materials is a decisive asset of the microporous material. 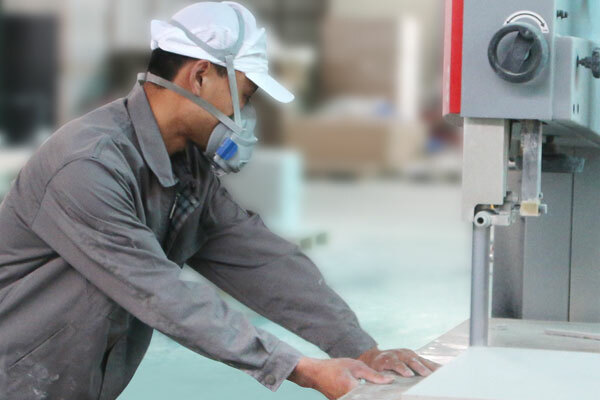 VIPs manufactured with silica cores can attain a service time of fifty years and more. Providing best in class stability makes the panels quick and easy to handle and reduces the damage loss to a minimum. As a result the VIP manufacturer attains the best insulation result of the VIP core. Extraordinary thin panels are available in a thickness to as little as 4 mm. This grants the VIP manufacturer flexibility in the VIP design. Wide customization of the panels ensures the optimum solution in differing contexts. The design of a customized mold reduces the cutting waste. 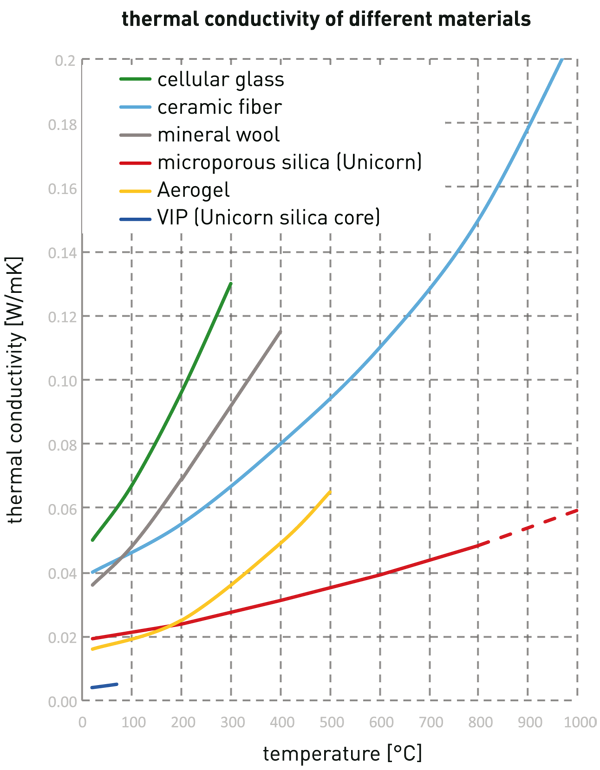 Excellent thermal insulation is provided by the Unicorn core itself, even when the vacuum no longer exists. In the case of such a critical condition of a VIP the very low increase of volume compared to other core materials is additionally very important. Absolutely non-hazardous material offers three benefits. The REACH regulation is met, the disposal costs at the end of the duration of use are very low and handling the material is in no way detrimental to health. Typical applications for VIPs are building insulations with zero energy or plus energy houses, the latest generation of refrigerators and various applications within the cool-chain logistics segment. The latter could be cool boxes, cool car insulation or cool houses. The use of a lamination enhances the performance of the insulation panel in two ways. It minimizes dust when handling the insulation material and reduces the risk of damage during installation, as the lamination provides an additional reinforcement. As an option the panels can be packed in POF shrink foil. Alternatively they can be laminated with aluminum or a non-woven glass fleece. The Unicorn VIP cores can be wrapped and sealed with a non-woven fabric. The user-friendly cutting service for panels and VIP cores allows a maximum of flexibility to ensure a fast and efficient installation. The service also avoids cutting damage at the customer’s site and reduces disposal costs. All Unicorn insulating materials are free of organic binding agents. They consist of silica (silicon oxide), an inorganic opacifying agent and non-hazardous fibres which are resistant to high temperatures. These inherently stable products are long-lasting, do not rot, are vermin resistant and easy to recycle. For these reasons the products are convincing economically as well as ecologically.